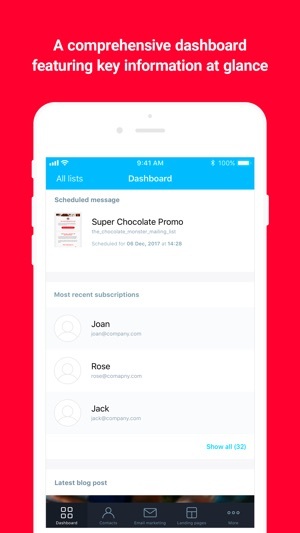 At GetResponse, we combined the world's easiest email marketing with the world's easiest app to make marketing easier than ever. 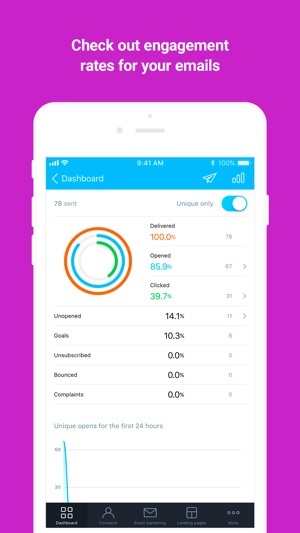 Manage your email marketing campaigns, collect leads, and keep up to date on your statistics while you’re on the go. 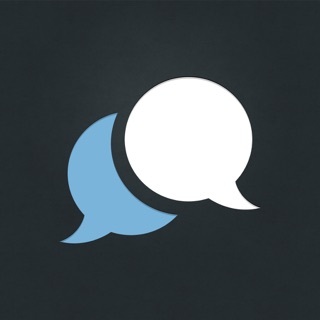 - Create plain-text emails on the go or send drafts previously prepared on your laptop or desktop. It’s available anywhere you go, anytime you need it. - Monitor campaign performance and forward reports by email anytime, even if you’re stuck in a traffic jam. - Add contacts by manual entry or import from address book. 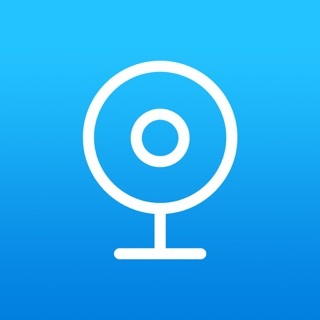 - Use the app on Apple devices of any screen size, from smallest iPhone to largest iPad. - Update your database, perform real-time searches, manage your subscribers, check real-time subscriber locations and activities. 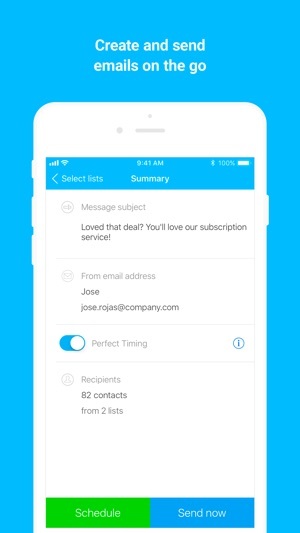 It’s the handiest way to manage your contact list. - Discover how readers become subscribers and learn why they unsubscribe. - Save time with easy-to-read graphs of open rates, available within 24 hours after sending an email. - No need to search for autoresponders stats. Just pin them to your dashboard. - Change the status of autoresponders from your mobile device. Activate and deactivate follow-ups while you’re on the go. 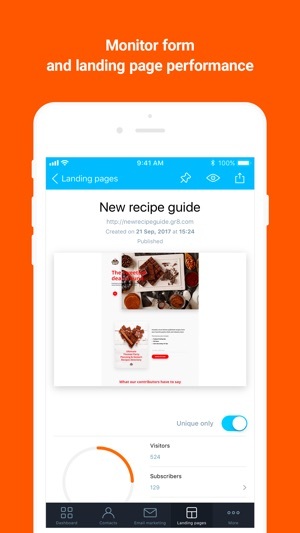 - Supervise campaigns remotely using the enhanced landing page module, with easy access to A/B test statistisc, landing page link-sharing, mobile inbox preview. - Stay up to date even if you’re away from your computer. Read important notices on your mobile device. - Get access to the latest GetResponse blog posts on your mobile device, now available directly from the dashboard. GetResponse is a complete email marketing platform, with tools for building entire marketing programs from start to finish on one platform. It includes innovative features such as responsive design, landing page creator, email analytics, email automation, and smart list import. The user-friendly interface, best-in-class 99.5% deliverability and 5-star Customer Service, make GetResponse the top solution in the market. Available in 12 languages, the system serves more than 350,000 customers from 193 countries, delivering 12 billion emails per year. We update our app in order to give you the best possible user experience! Very clunky app. Please remove it from the App Store until you guys get serious and fix or redo it. All sorts of issues, crashes, no ability to even add a logo or other image, total of recipients when selecting certain lists does not match the total shown in the actual desktop software with the same lists selected. Most importantly, there was a typo in my subject line. Upon reviewing it and before sending it out, I changed it. But when I hit send and then checked my email inbox, the change had not been saved. I still had an “of” instead of an “If” so the subject line, most important part of getting a good open rate, ended up looking stupid and embarrassing in front of our 2,000 subscribers. 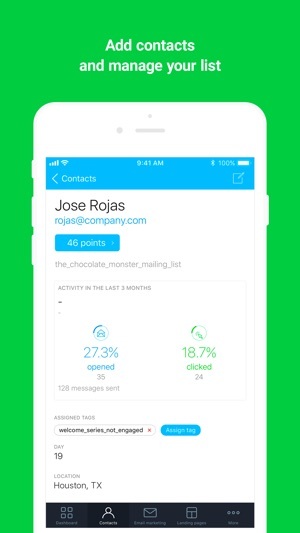 Still love GetResponse as a platform, but the mobile app is probably an idea that should have been left on the drawing board for a few more years. I tried GetResponse because I was excited they had a mobile app. But when you find a bug or something wrong with their app or platform and contact them, they just try to argue with you instead of fixing it. GetResponse has the worst customer services any company I've ever dealt with. © 2016 GetResponse sp. z o.o.